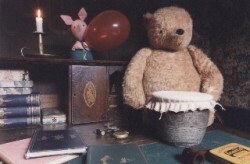 In 1995 someone at the Netherbow Theatre suggested we seek permission to adapt A A Milne’s Winnie the Pooh stories, and for the next five years virtually every show was sold out. The subsequent touring schedule included a sell out run at the Royal National Theatre and two appearances at the Edinburgh International Children’s Festival. In 2000, the Disney Corporation bought the rights to Winnie the Pooh and permission to perform the stories dried up.